We all recognise this disease in aging dogs. Arthritis is a degenerative process that arises as a result of abnormal stresses acting upon normal joint cartilage. It is characterised by progressive stiffness and a decline in activity. The disease is progressive but varies greatly in its severity between individuals based on size, breed and age. For many dogs the underlying causes are a complex combination of genetics and environmental stresses. 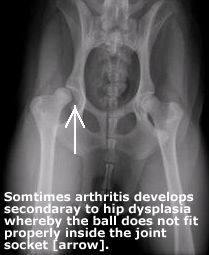 So for an individual the underlying cause may be genetic-for example he may have hip dysplasia-but the expression of these genes and hence the rate of arthritic development may depend on his body weight, his growth rate and the amount of exercise he gets. Over-exercised dogs and certain breeds such as German Shepherds and Labradors may have an earlier age of onset. -generalised slowness and stiffness, especially on walks. Some dogs may lag behind or stop to rest on their walks. -slowness or stiffness or general difficulty when getting up from a lying position. -difficulty jumping into the car or up onto the couch. -reluctance or hesitation in negotiating stairs or obvious difficulty actually going up or down stairs. Some dogs may bunny-hop up or down stairs. -lameness on one or more legs when ambulating. This may be particularly noticeable when they first get to their feet. They may also resent certain areas been touched. There is usually little difficulty in diagnosing this condition on the basis of what the owners report the dog to be doing, combined with a clinical examination of the dog’s musculoskeletal system. 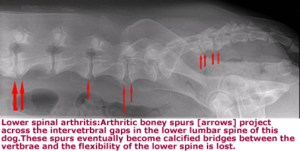 Xrays nearly always confirm the disease. Arthritis is a progressive, incurable disease. Treatment is therefore centred around reducing its effects, managing pain and slowing down its rate of progression. Management of arthritis relies on doing some practical things to help the dog cope as well as medications that are designed to either eliminate pain or slow down the progress of arthritis. 1.Exercise, rest and recovery: it is recommended that an arthritic dog’s exercise is managed to reduce pain and to reduce the progress of arthritis. 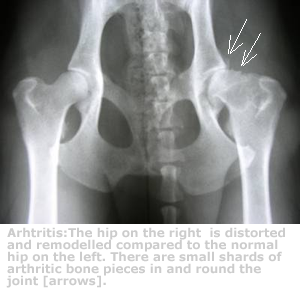 The more a joint is used, the more it produces wear and tear and hence the more that arthritis develops. It is said that it is helpful to maintain muscle mass to aid joint function; but one needs to strike a balance between preventing the ongoing progress of arthritis through stress and strain on joints from ongoing exercise, and at the same time maintain muscle mass and tone. In practice this is a difficult balance to achieve and as time goes on you will find that exercise for the geriatric in general just hurts and at the same time despite this exercise, muscle mass continues to decline. It then becomes more important to keep these dogs pain-free by walking them slowly over limited distances so that they can spend more time stopping to smell interesting smells etc. Always remember this is why dogs like to go for walks anyway-not for the aerobics! The joints also need to recover from stress so it is recommended that dogs have a good solid, flat bed to rest and sleep on with a foam-rubber mattress or base. Hammock beds and bean bags are probably not appropriate. It is more desirable that dogs can stretch out and relax and have their body weight evenly distributed over a foam base. This tends to take the weight off the joints more effectively. 2. Glucosamines and Omega 3: These products are the mainstay of arthritic management. They are available in several different forms-tablets, treats, powders or pills and are incorporated into some foods. These neutraceuticals attempt to repair damaged arthritic joint cartilage as well as having an anti-inflammatory effect. Arthritis is not curable but these products attempt arthritic repair. They are not fully successful of course but their actions slow down the rate at which arthritis is progressing and definitely improve the quality of life for these dogs. We would make special mention of the Hills JD diet based on experience. The glucosamines and Omega 3 fatty acids are balanced properly in this product taking away any guesswork regarding glucosamine dose rates and bioavailability of the active ingredients. 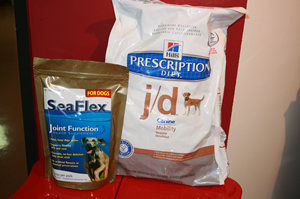 We have seen arthritic dogs do extremely well on this product. 3. Pain management: From time to time arthritic dogs will have flare ups resulting in acute pain episodes. They will have a day when they are extremely stiff and slow and may not even be able to get up. These episodes frequently follow a day of exercise when they overdid it a bit. On these occasions they will need a course of potent anti-inflammatories to get them through the day. In late stage arthritis many dogs have to be on these medications most of the time. However they do give dramatic pain relief and really help to improve the quality of life for these dogs.